Curt Goodrich | Why not? I first saw this cable stop design while working at R&E Cycles in Seattle. 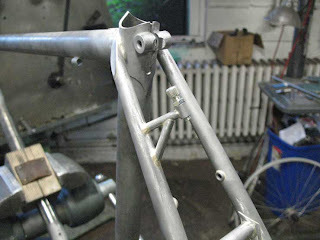 An old Rodriguez custom frame was in for a re-paint. It had this type of triangulated cable stop. I always liked the look and have been using it on a few Goodrich’s. Perhaps I’ll continue to use it as a signature of sorts. We’ll see. It’s more work but worth it, I think.